Free Video Converter is a free software from Koyote for converting video from numerous video formats, such as AVI, Mp4, iPod, PSP, 3GP, Zune, iPhone, MKV, WMV, ASF, MOV, QuickTime, MPEG, MPG2, RM, VCD, VOB, AVCHD MTS, M2TS. The software has a simple interface and easy to use with low memory consumption. Current release is Version 2.5 which can be downloaded here. 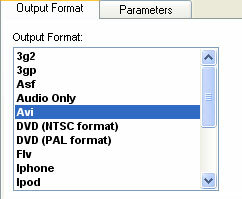 Select output format (eg: Avi). Every output format has it’s own video and audio settings.